The 39 Express Coupe was first introduced to Canada at this year’s Toronto International Boat Show. 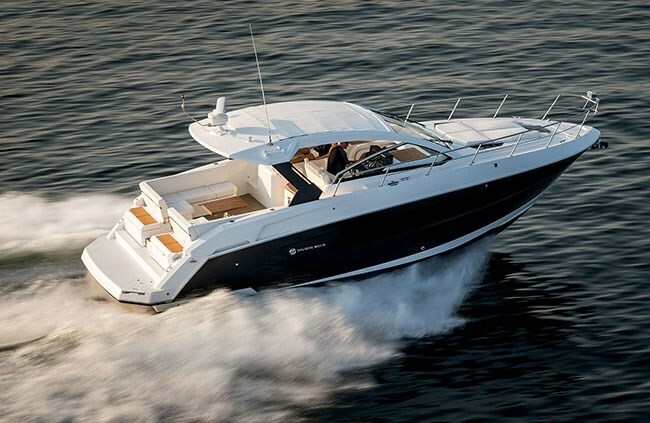 It is one of nine models in Cruisers Yachts “Yachts” series from thirty-five to sixty feet. This Oconto, Wisconsin company also offers nine models of bowriders, sport cuddies, and express cruisers in its Sport Series for 2016 ranging from twenty-three to thirty-four feet. Flexibility is the operative word in describing the 39 Express Coupe especially when considering cockpit seating and entertaining. Two molded steps up from the low-to-the-water integrated swim platform with concealed boarding ladder plus twin top-hinged large transom storage boxes leads to the single level cockpit. There, twin L-shaped stern lounge seats with storage beneath the seat cushions literally fill the entire aft portion of the cockpit providing plenty of seating with a centre transom walk-thru. Unique to this cockpit seating arrangement is that the entire port side and stern L-shaped section is on a slider to join its starboard counterpart to create one huge booth-style seating thus changing the center transom walk-thru to the port side. Both walk-thru’s have safety gates. Now flip back and down, either manually or optionally electrically, the stern seatbacks of these twin lounges and you have created one huge aft sunlounge with its forward seat bottom cushions adjustable upwards to create aft-facing backrests. 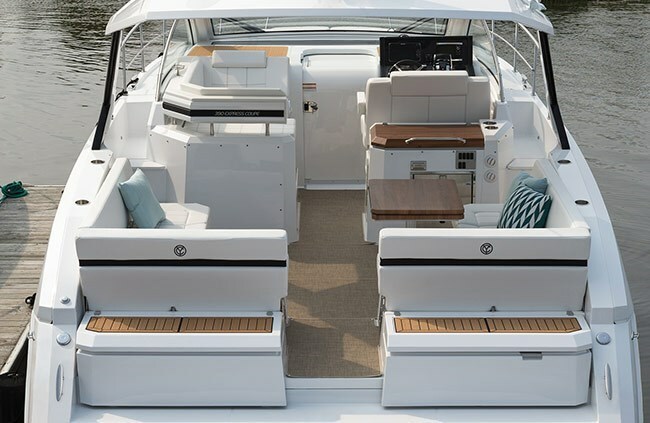 Then choose the optional folding leaf, hi-lo cockpit table with filler cushions and virtually the entire aft cockpit is one giant sunlounge. Aft of the double wide helm seat with flip up bolster is a standard cockpit wetbar with sink and which may be optionally fitted with a refrigerator, icemaker, and gas grill. Opposite the helm seat is a raised port side L-shaped passenger lounge seat with forward, side, and aft-facing padded backrests. An aluminum hardtop with or without a power sliding canvas sunroof is standard and is optionally available with a solid sliding sunroof panel. Flexible power options are also available for the 39 Express Coupe. Choose twin gas or diesel sterndrive power from either Volvo or MerCruiser with DuoProp plus Joystick and Bravo 3 plus Axius respectively from 380 to 430 horsepower in gas, or 300 to 335 horsepower in diesel sterndrive. 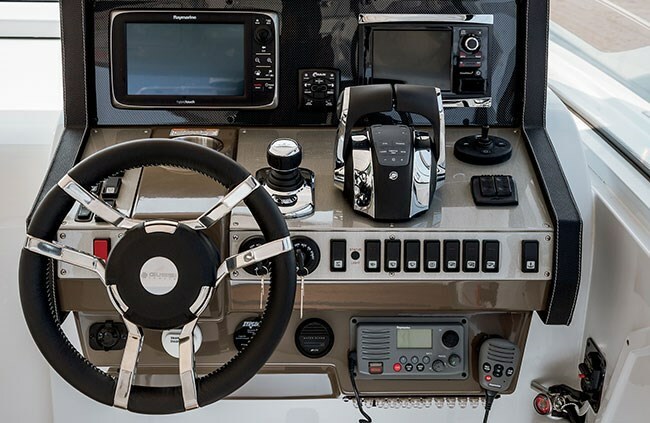 You may also choose Volvo Penta IPS 400, 450, or 500 diesel (Pod Drive) with Joystick control from 300 to 370 horsepower. Instrumentation at the helm will vary slightly according to the power you choose. With all power choices, a joystick is standard as is a gas or diesel generator with available upgrades. Volvo power provides colour engine readout display with GPS while MerCruiser power provides Mercury® Smartcraft™ colour VesselView engine readout display with GPS. Trim tabs, remote spotlight, anchor windlass, hourmeters, depthfinder, and starboard windshield wiper are all standard. Electronics packages including sonar, radar, plus autopilot, and a Glass Cockpit package are available. Through the sliding, screened cabin door and down an open staircase with solid wood steps leads to the cabin with commendable six-foot, six-inch headroom and lots of natural lighting from large hullside fixed windows on both sides. 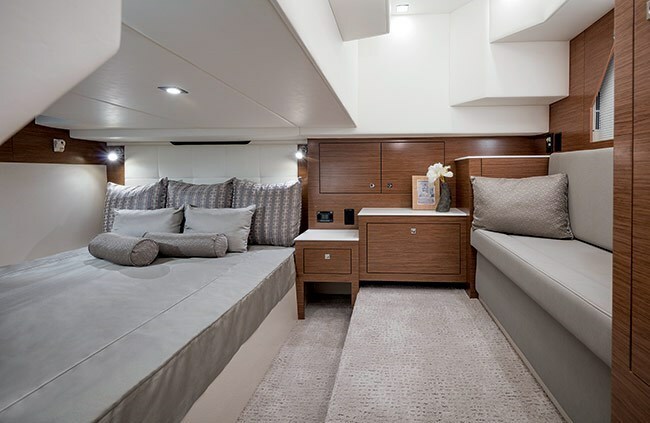 Even the aft master stateroom with solid privacy door has standing headroom plus an island double berth with Therapeutic mattress, large cedar-lined locker plus ample storage. 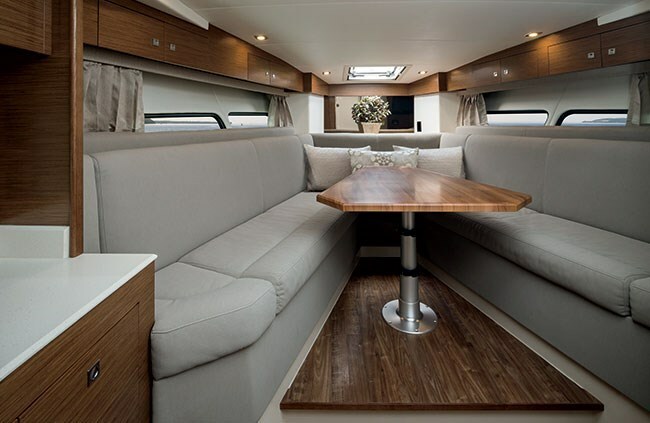 The V-berth convertible dinette with full length upper and lower storage and with hi-lo table seats seven persons with standard Ultraleather™ upholstery. 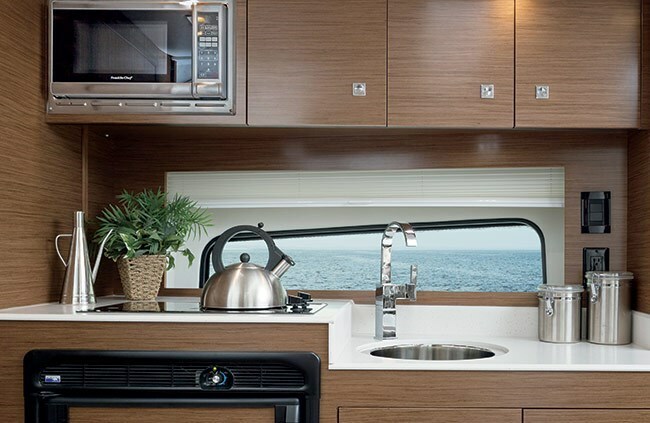 The portside galley comes standard with stainless sink, refrigerator/freezer, two burner electric stove, microwave, lots of cupboards and drawers plus a trash receptacle. 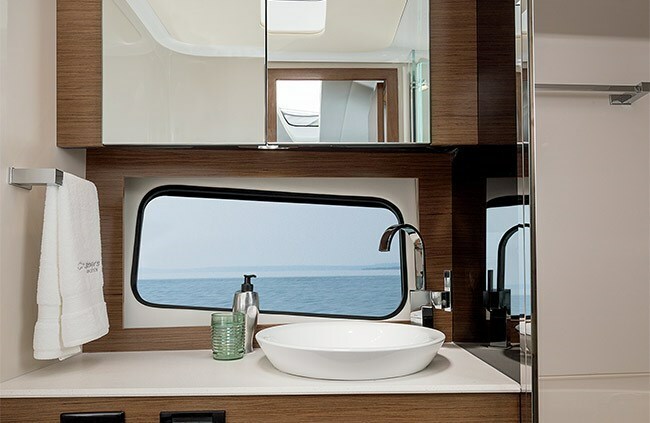 The head compartment features a separate shower stall with bi-fold door, centrifuge head, sink, upper and lower vanities, and mirror. Standard hull colour on the 39 Express Coupe is white with Slate Gray, Blue, or Black available. Other most notable of considerable standard equipment includes cockpit carpet, hot & cold cockpit shower, cockpit washdown, anti-fouling bottom paint, cabin air conditioning/heating, automatic fire extinguishing system, twin 30 Amp dockside power, Sony AM/FM/CD/MP3/iPod®/Satellite adaptable stereo with four speakers plus helm remote, and a canvas hardtop enclosure with aft drop curtain. 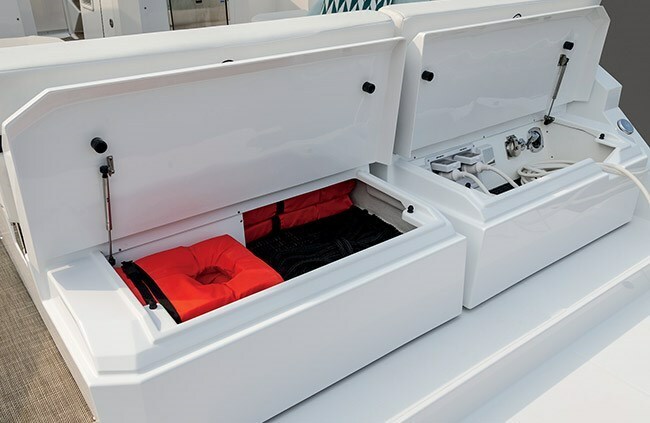 Most notable additional optional choices among several others includes Woven Mat or teak cockpit and/or swim platform covering, windshield defroster, underwater lighting, premium stereo upgrade, cockpit and/or cabin TV/DVD, cockpit air conditioning/heating, central vac, custom fitted sheets, foredeck chaise lounge, flip-up side bunks in the V-berth, and a full camper back cockpit enclosure. The Cruisers Yachts 39 Express Coupe – flexible, roomy, and well equipped.